First Thought Equine Ltd is a British based company formed in 1996 to market the Flair system. Since then, the company has grown, first by marketing Flair around the world, and secondly by developing new and innovative products in the equestrian field. In two years, Flair was being sold and fitted in 15 countries, and being fitted in new and old saddle by saddlers and saddle manufacturers. The second product to be launched was Korrector, in 2001. Originally developed to Flair western saddles, it proved so good at correcting problems of fit in English saddles. Korrector has gone through some changes in its time, and with the introduction of the all leather version and new western felt pad, cannot be surpassed for performance. Whilst working with manufacturers and saddlers alike, it became apparent there was room for dramatic improvement for the traditional English saddle. Three years of R&D produced the first WOW saddles, tested independently in at least three continents, and consistently out performing its competitors in pressure and gait analysis tests. 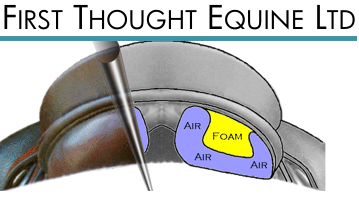 Every product First Thought Equine develops is for the benefit of the horse’s health and well being, but moreover for enhancing the performance of the ridden horse. All our products are manufactured in Kent in England, and where possible, all materials used are sourced from British manufacturing companies.